Below, you will find a listing of all the herdsires we have had. They are listed from current herdsire back to the foundation herdsire. We tend to change rams frequently, due to having such a small breeding flock. You will notice a gap at the 2009 lambing season, that year's ram did not perform his duties and we had no lambs that year. The 2 earliest rams were both from Fine Fettle Farm and are Lasseau descendants. They are also half brothers through the ram. We were not aware of this until 2010. We assumed we were sold breeding pairs of unrelated stock. The next 2 rams were from Southwind Farm. We had decided to introduce a new bloodline after having issues with meeting the breed standard in our previous batch of lambs, which was due to unknown inbreeding on our part. We have introduced a new line into our flock with the acquistion of Unzicker Mel. We were very pleased with his 2012 lambs. The lambs are showing good size and excellent fleece characteristics. Benjamin and Benoni are 2 rams of our own breeding that we fell in love with. We are being particularly careful in which ewes we breed them to. Benjamin's 2012 lambs showed good fleece characteristics, as well as, excellent horn placement and growth. Benoni is replacing his father, Benjamin, for the 2013 spring lambs. We are looking forward to seeing if the son can match the father. With Mel moving on November 2012, his son, Saul, will be taking his place. Saul was chosen because of his remarkable size, 25 lbs at 5 weeks of age, and his performance at the 2012 Northeast Regional Jacob Sheep show. With careful planning, we should see some really good lambs from him. New to the breeding line-up for 2013 is Unzicker Zane. He comes to us from Ivy Brook Meadow. He has some remarkable bloodlines, which are only very distantly related to our girls (original foundation stock). He is a known lilac carrier and we are hoping that breeding him to our known lilac carriers will improve our chance for lilac. For the fall of 2014, Unzicker Zane will be the only flock sire, as JM Farm Mel's Saul has moved on. JM Farm Saul's Job will be replacing his father for the fall of 2015, once he has attained a size to compete with the pushier ewes. Zane's 2015 lambs were of good quality and all but the ewe lamb we retained have found new homes. Zane has left the flock, but is being replaced by 2 young rams for the fall 2015 breeding lineup. Unzicker Wembly is joining us from Ivy Brook Meadow and Armstrong Forth is a last minute addition. With 3 rams for 2016 lambs, we should see some diversity and earlier lambs. We had a really good crop of lambs for 2016 with 5 being retained from the various fathers. 2016 saw Armstrong's Forth and JM Farm Saul's Job leaving the flock. JM Farm Forth's Jude will be replacing his father, Forth, and his uncle, Job. Unzicker Wembly will make a return performance for 2017 lambs. 2017 saw us win our first blue ribbon ever with our 2017 ewe lamb, JM Farm Jude's Charlene, at the JSBA AGM. She also brought home the Best Fleece award. Her father, JM Farm Forth's Jude, has moved on along with Unzicker Wembly. We have retained several ewes from each sire. 2018 lambs will be sired by Unzicker Zeke, the replacement for Jude and Wembly. Zeke placed 2nd in his class at the 2017 JSBA AGM. We are looking forward to his lambs. With the departure of JM Farm Forth's Jude and Unzicker Wembly, we purchased this fine 4 horned ram from Ivybrook Meadow Farm. Zeke has a beautiful fleece and great hornset. He placed 2nd in the Senior Ram Lamb class at the JSBA AGM in NY this summer. We look forward to seeing his lambs in the spring of 2018. With the departure of his father, Forth, and his uncle, JM Farm Saul's Job, Jude will be taking their place for the 2016 fall breeding. He will have about 1/2 the ewes with Unzicker Wembly making a return performance with the remaining ewes. We look forward to seeing what this young ram can do. Wembly will be replacing Unzicker Zane as the 2 horned herdsire for fall of 2015. He has an excellent set to his 2 horns and a wonderfully soft dense fleece. We look forward to seeing his lambs. Forth is a last minute addition to the breeding lineup for fall 2015. He comes to us from another breeder in NY that took a fancy to one of our ram lambs and traded us Forth for him. We like his looks enough to offer him some of the ewes for next year's lambs. Job will be replacing his father, Saul, as the 4 horned herdsire for the fall of 2015. He will be offered what ewes are not too closely related to him. He is the first of our herdsires to be lilac. He has a wonderful set to his 4 horns, nearly a perfect x formation. He also has a wonderful open fleece. Job has a pleasant personality. Purchased from Ivy Brook Meadow as ram lamb to replace JM Farm Benjamin's Ben-oni. Comes from really good bloodlines that are unrelated to the rest of our flock. Known lilac carrier. Will be offered half the flock in fall 2013. With Saul moving on in 2014, Zane will be responsible for all 2015 lambs. Saul will be joining the herdsires for spring 2013 lambs. He is a remarkable ram lamb. He is the largest, fastest growing ram lamb in the flock. Saul has an amazing set of 4 horns and a wonderful fleece. He placed 3rd of 16 ram lambs at the Northeast Regional Jacob Sheep Show in 2012 and also brought home the prize for Best Fleece. He will be inheriting some of the ewes from his father, Unzicker Mel, who will be leaving us part way through the breeding season. We look forward to seeing his lambs--may they be as fast growing and well fleeced as he is. Saul has blessed us with a large number of ewe lambs and some really remarkable sons. We have retained several of his daughters and one son for fall of 2015. With the number of his progeny, he has moved on to other pastures. 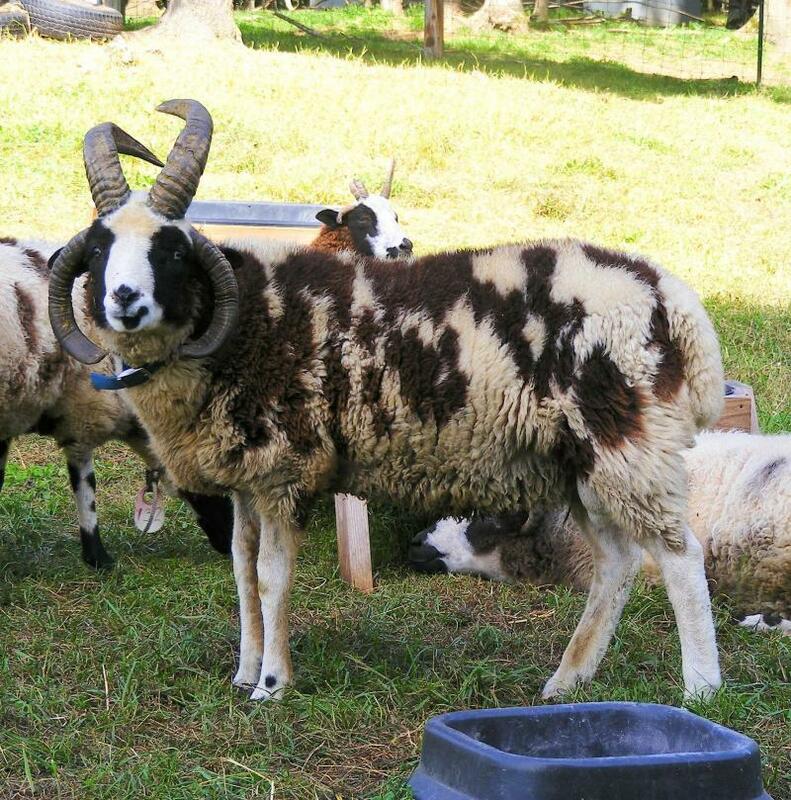 Ben is a handsome 2 horned ram. He has all the markings and a nice set to his horns. His fleece is quite soft and open with medium staple. Ben placed 2nd as a yearling ram at the Northeast Regional Jacob Sheep Show in 2012 and was also part of the group that took 1st in Get of Sire. With his father's departure in August of 2012, Ben has inherited part of the flock. We wait with anticipation for his lambs to arrive. This handsome fellow will be joining JM Farm Panterra's Benjamin for the fall 2011 breeding season. He was purchased from Ivy Brook Farm to breed the ewes that Benjamin should not breed. He was shown in the Maryland Sheep and Wool Festival, and not only placed first in his class, but also won Reserve Champion ram for the breed!! We are expecting good things from this guy. Produced excellent lambs in 2012, including the new herdsire JM Farm Saul and the ewes JM Farm Tama and JM Farm Beulah. Offered the bulk of the flock before departing in December 2012. Benjamin was originally slated to be sold, but after looking at him again when we brought him home from summer pasturage, we fell in love with his markings. He is currently in with the ewes that are not related to him. We are hoping his father left a few ewes for him. He produced a ram, current herdsire JM Farm Ben-oni, and a ewe, JM Farm Charity, in 2011. He was offered half the flock in fall of 2011, producing several rams and ewes, including JM Farm Divinia and JM Farm Joelle. He left for a new flock in August 2012. Replaced by his son, JM Farm Ben-oni. Panterra was purchased as a ram lamb from Southwind Farms in June of 2009. He bred half the ewes in the fall of 2009 and produced 2 beautiful ewes, JM Farm Abigail & JM Farm Elizabeth, and 2 rams, including the herdsire, JM Farm Benjamin. Panterra produced such nice lambs that we decided to use him as the primary herdsire in 2010, giving him the opportunity to breed all the ewes, but his daughters. He was sold in October 2010 to another breeder. Pepito was purchased as a ram lamb from Southwind Farms in June 2009. He was bred to half of the ewes in the fall of 2009. He produced 2 ewes, JM Farm Jamisen and JM Farm Delilah, and 3 rams. We were a little disappointed in the markings of his lambs (3 had marginal markings--missing facial markings, too little color), so we sold him without offering him anymore ewes. Lucky was purchased as a bottle lamb from Fine Fettle Farm in 2006. He had a massive set of 4 horns and beautiful markings. He is unregistered because we never got around to it before he left. He bred part of the ewes in the fall of 2006 and gave us 1 ewe lamb, JM Farm Bethany and a few rams. He bred all the ewes in 2007. The 2008 lamb crop was very disappointing, we only had 2 registrable lambs in the bunch, JM Magdelene and JM Samuel, the others had various disqualifying traits (split eye deformity, missing markings, scurs instead of horns). We learned in 2010 that the deformities were due to inbreeding, we had unknowingly purchased half-siblings. We sold him and kept Samuel to breed some of the ewes, except he didn't breed any of them. No photos survived the computer melt down. Abraham was purchased as a bottle lamb from Fine Fettle Farm in 2005. He had a very mild disposition. He gave us some nice lambs, including JM Farm Naomi and JM Farm Joanna. He also has several granddaughters and great-granddaughters in the flock. He left before we started to register the Jacobs. Nehemiah is a handsome 4 horned wether. He was wethered because we needed a 4 horned male for a gentleman who rents our sheep as attractions for his woolen business. He was also wethered because he has a type 2 split eye deformity, which made him ineligible for registration. Joel was taken from his mother at birth because he was so much smaller than his twin. He was raised as a bottle lamb and we just couldn't part with the sweet guy, so we wethered him. He is also 1 of 2 lilac Jacobs in our flock. He would not be eligible for registration with those horns so close to his head. 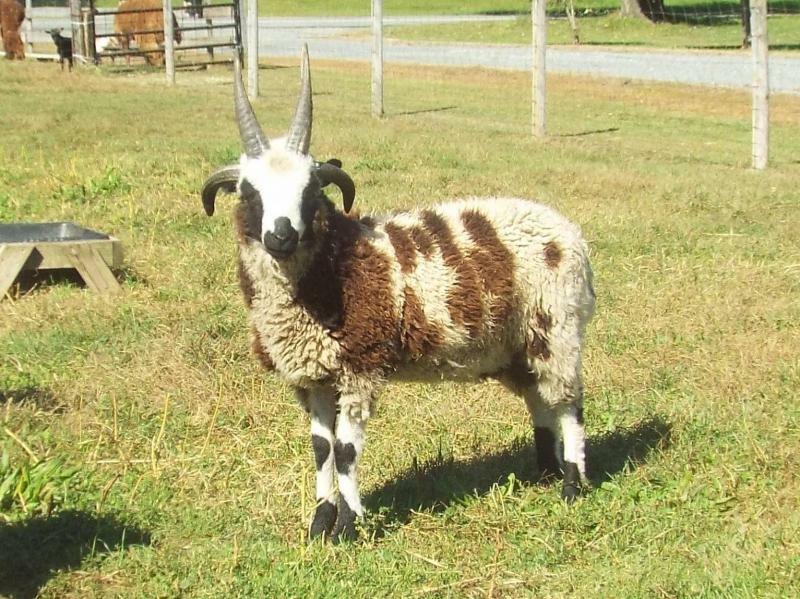 Nathan is a handsome 5 horned(fused) ram that appears as a well-balanced 4 horn. He has a marvelous fleece and temperment. When he did not find a home as a breeding ram, we decided he was just too handsome and well-mannered to sell as a market lamb. But since we could not us him as a breeder ourselves (too many relatives), we wethered him. He will be joining Nehemiah as a tourist attraction. Dan's story is unique. He was born just like other lambs, but his mother was a very flighty ewe (scared of her own shadow). She accidently stepped on his rear legs in her flight and managed to break both of them. The damage was so bad that Dan lost the foot on his right leg and the lover portion of his left leg. Luckily both losses were at the respective joints making replacement easier. He walks on his own with the help of some homemade prostetics made from conduit connectors and rubber stoppers from the Home Depot. The artificial limbs are held in place with VetRap. He managed to nurse his mom until weaning and has improved greatly over the summer. He now lives with 6 other lambs and sometimes tries to run. It is amazing how strong his will to live is!